Diano Calderina is a small Ligurian town located above Diano Marina. Corpus Christi is a big colorful festival celebrated every year. Residents decorate the streets around the church with colorful flowers and petals. Diano Calderina is a village in the Diano Marina Municipality located on a mountain above the Municipality. Part of the region was already inhabited in prehistoric times and later became part of the Marquise of Clavesana’s territory. Diano Calderina was incorporated into the Diano Marina Municipality in 1199. 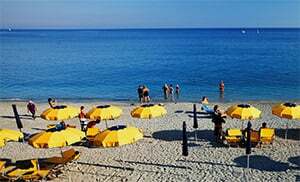 Diano Calderina is part of the Diano Marina Municipality and is a village in Imperia Province located in the Liguria region. There are several other villages near Diano Calderina like: Muratori (1.3 km), Serreta (1.7 km) and Gorleri (3.4 km). Take the highway exit San Bartolomeo al Mare from Genoa, and then follow the SP34. Turn onto the SS1 towards SanRemo after which you take the Via Diano Calderina to Diano Calderina.